Habu is used across a workspace to create smooth, seamless experiences for all kinds of users. Check out the sections below to find out more info. Your members define your workspace. So it makes sense that making things simpler for them makes life simpler for you, and Habu provides the tools to do exactly that. The Habu User Area is an intuitive, powerful, and elegantly designed resource offering members autonomy and liberating you from a huge range of day-to-day tasks. Your customizable workspace dashboard allows all workspace users – not just members – to see what's going on with their account at a glance. Our focus on user-friendly design ensures that your users can make bookings and check in, top-up allowances and access any of the services you offer quickly and effortlessly, from any device. No receptionist? No problem. Users can check in and out of your workspace on their own. Habu tracks their time, then uses allowances or bills accordingly. Our innovative and intuitive design places your meeting rooms front, left and center while creating a brilliant booking experience for your workspace community. Gone are the days where the pain of selling and managing day passes outweigh the benefits. In a couple of steps, members can purchase without you doing a thing. Keep your workspace community informed. Let them know who to contact for support, who's on your team, week-by-week opening hours & how to find your space. With Habu, members always know where they're at with their remaining allowances for the month. Plus, when they're low on credits they can easily top-up in seconds. Got workspaces and bookable spaces in different locations? Your members can switch their location directly from their dashboard. 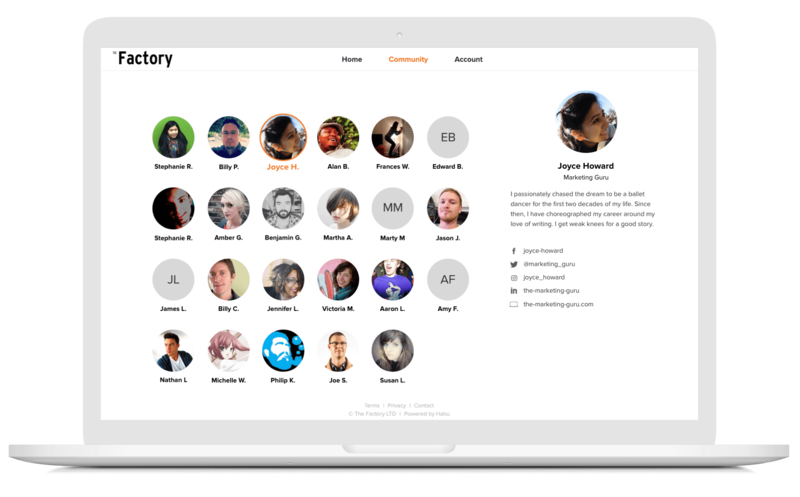 Onboarding new members and connecting existing members is easy with your community directory. Habu delivers at-a-glance information about the members in your space, giving them an overview of your community and accelerating conversations and introductions. And there’s much more to come with in-app chat and a skills-sharing directory, as well as the ability to stream workspace events and bring your network of mentors directly to your workspace community. When a new member joins your workspace, help them feel at home by linking them up to your online community. From there, they can easily see who's in your community, what they do and connect with them. Once they meet face-to-face they'll know how to start the conversation off on the right note. With the skills directory, your members can advertise their talents, as well as search for the skills they need for their next project. Call it a 'Jobs Board', 'Talent Pool', or whatever you like. Quite simply, it's a great way to help your freelance community connect and flourish. There are almost as many ways to book a space as there are coworking spaces. But using Google Calendars, a piece of paper or a mixture of different online tools just doesn’t cut it in a world where users now expect taxis and food to be delivered straight to their phone. That's why Habu's beautiful user-led booking experience is a game changer. 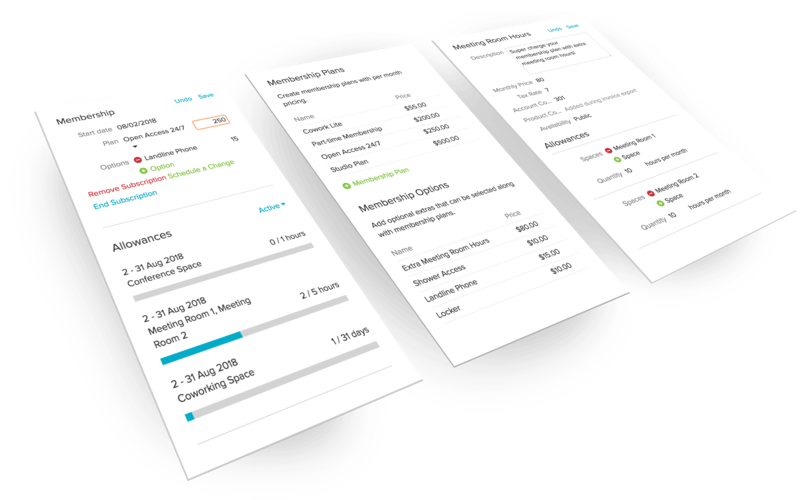 It is elegant, intuitive and simple for your workspace community to use every step of the way, empowering them to make and manage their own bookings. What’s more, you can drive your revenue and room utilization up with powerful tools that enable you to embed an exquisite booking flow directly into your website. 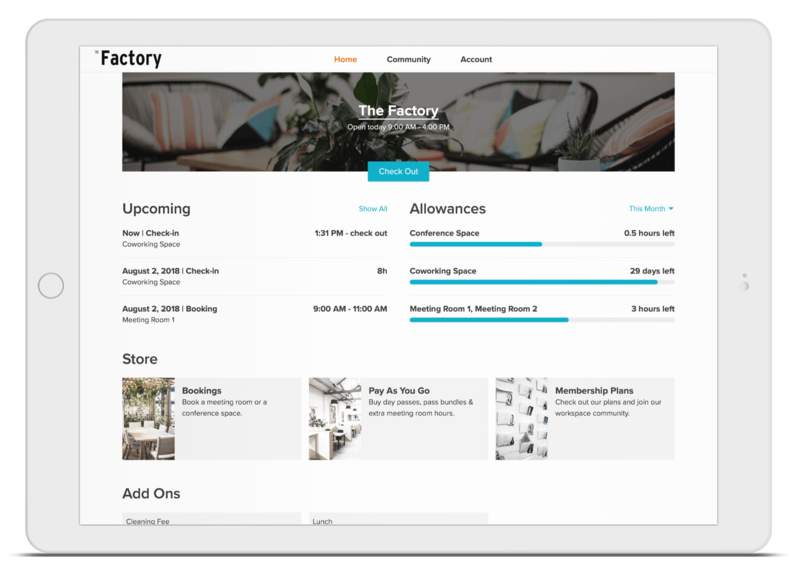 Letting your members edit their own bookings as well as enabling out-of-hour member bookings for full member autonomy. That means freedom from the grind for you. Available on any device, anywhere. User-led bookings are optimized for any device, anywhere. And there's no need to download a separate app for your users. Through the User Area, bookings can be made in seconds. The User Area provides an intelligent, dynamic, and beautifully designed way for everyone who uses your space to access the services you offer. Think of it as a marketplace that anyone can access, but where members have different experiences to non-members. So whether space users are buying day passes or signing up to a membership plan, ordering your finest coffee mugs or tickets to upcoming events, they have 24/7 access to the things you offer in a couple of clicks. Buying a day pass, or a bundle of day passes couldn't be simpler for your workspace users. You set the details and expiry and they buy them when they want. Members running low on allowances? Your users can supercharge their account with customizable booking packages for your event and meeting spaces. Empower your regular space users to join your coworking community with a delightful self-sign up experience straight from your space's User Area. Say goodbye to complicated bookings. It's actually fun for your workspace community to book spaces through our outstanding booking tech. And it's minimal effort for you. Want members to pay later via auto-billing plus make non-members pay up front? With Habu you can provide a seamless experience for everyone. 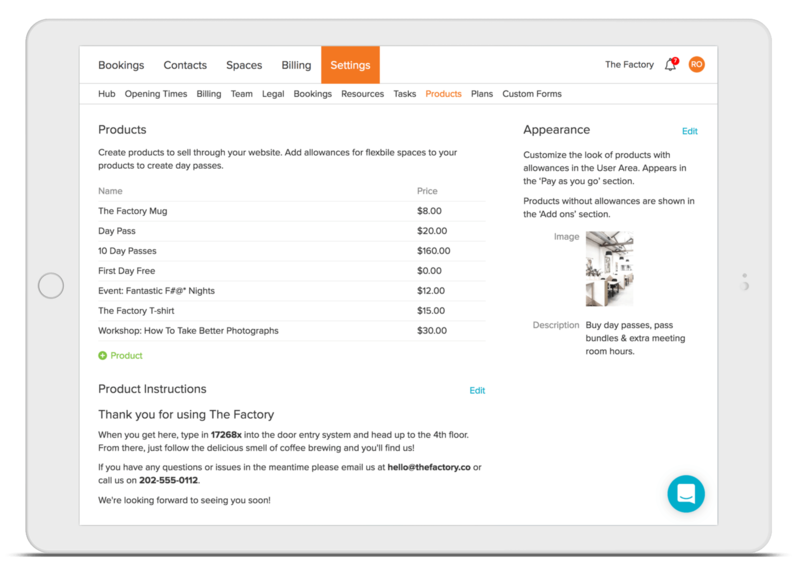 Your workspace users can buy anything you offer, direct through your marketplace. Event and workshop tickets, coffee cups, t-shirts, and just about anything else! We get it. Repetitive questions from members can be tiring and distract you from day-to-day tasks. Questions like, "Hey! Can you send me last month's invoice," or "can you add our company credit card to my account?" all add up to a lot of unnecessary admin time. With Habu, your members take ownership of the details that matter to them the most: their own. They can update payment details, request changes to membership plans, view past invoices and upcoming charges, plus much more. Providing more autonomy to your members liberates you from a stack of work. That’s something we can all get behind. When it comes to managing plans, there's plenty of back and forth when members want to change things. With Habu, members can schedule changes to their own plans, as well as add or remove add-ons from their subscription. Members are no longer in the dark when it comes to billing and payments. Now they can easily view past and upcoming charges to their account. Ditto for invoices. Habu streamlines your day-to-day operations bringing clarity and automation to your workspace simply and flexibly. This means you can finally focus on what really matters: the people in your workspace. 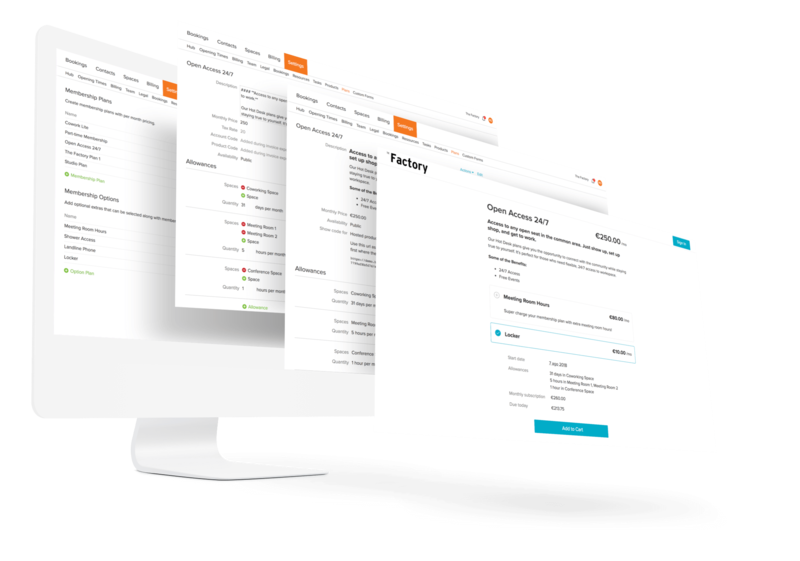 Habu makes plan management a breeze, balancing simplicity and flexibility without sacrificing the power you expect from a cutting-edge workspace management platform. Our customers love how easy it is to create new plans, refresh old ones, and offer customized subscriptions on a member-by-member basis. At every step of the way, you can structure membership plans to suit your needs, track allowances and control plan visibility all while providing your future members with a frictionless, self-sign up experience. Combine any mix of meeting room, conference space and hotdesk allowances, plus additional products, to create the perfect plan. For simple, streamlined membership signups, embed plans into your website. A delightful user experience is guaranteed. Let our billing engine take care of your monthly invoicing and payment processing. Never lose track of a late payment again. Hey, this is just a demo... you need sign up to do that! Click around to test the check-in flow! Hotdesks are at the heart of any flexible workspace, whether you’re running an indie coworking community, a network of enterprise spaces or flex offices for 500+ employees. Habu eliminates complexity, refining hotdesk management. Users can book ahead, buy day passes or pass bundles, and check themselves in. Walk-ins are managed with elegant efficiency. And at every step along the way, Habu tracks desk usage minute-by-minute. And in 2019 Habu will redefine hotdesk management, bringing pioneering automation to the fore. Keep your space open to new leads who walk-in. Within seconds, you can create an account and take upfront payment. Or just let the clock run for per-minute, hourly & day pricing. Allow members to reserve desks in advance so you always know who to expect without exceeding your per-day capacity. It's all a part of Habu's hands-off hotdesk experience. It’s never been easier or quicker for workspaces to create a top quality marketplace. The Habu store enables members and non-members to easily access the array of products and services that your workspace offers. And you’re always in control of who can buy what and when they pay with features such as product access levels and upfront-payment vs. pay-later options. 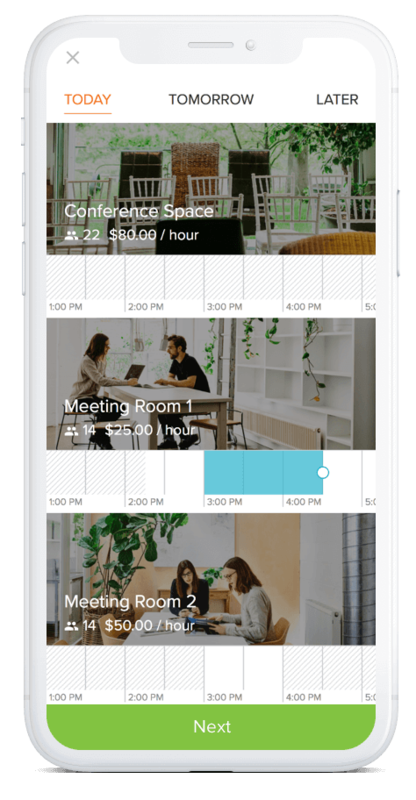 Whether you want to sell day passes, extra meeting room hours events, or t-shirts, with Habu products, your workspace users can buy anytime with a sleek and seamless experience. Creating & selling day passes couldn't be easier, whether it be a single day pass, a five day pass bundle or anything else. Embed products in your website or let members buy products via our fantastic User Area. No website genius required. You have the power to control who can buy what. Member only, public or private products. The choice is yours. Habu provides the industry’s leading toolset for configuring and create booking flows that will set your workspace miles apart from the competition. Our end-to-end, integrated approach streamlines bookings for your members and non-members with exceptional user experience every step of the way. Whether you offer a self-service booking model or take a more hands-on approach, Habu provides powerful ways to configure and control settings on a space-by-space basis. Our beautifully designed booking platform and commission-free bookings are intuitive to set up and will delight both you and your space users. Members-only spaces? Publicly bookable spaces? Private spaces? However you like to run things, it couldn't be simpler to control who can view and book your meetings rooms and event spaces. Configure spaces your way with stacks of functionality. Turnaround times between bookings, minimum booking lengths, and out-of-hours bookings for members all in a few clicks. Tired of people turning up to your space when you're not about? With Habu, you can set space hours on a per day basis and add in holidays to prevent bookings when the space is closed. No more rogue bookings. With all that buzz going on, you must stay organized. 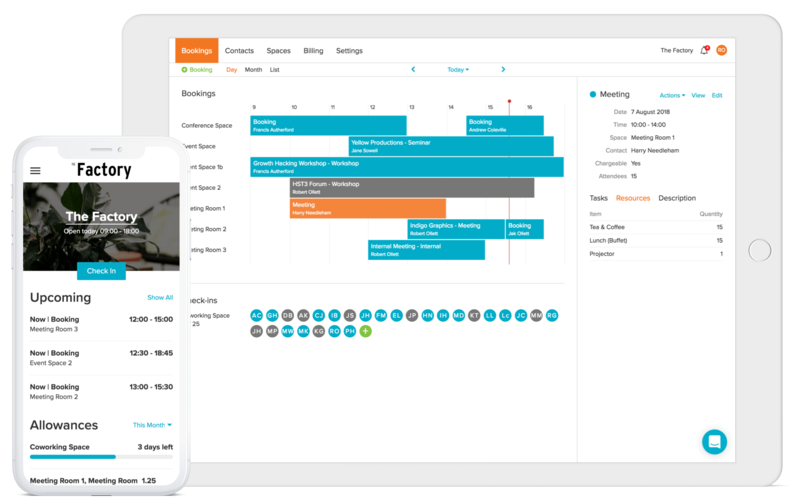 Habu helps by letting you create custom booking types, conduct deep searches of all bookings, create booking tasks, and view daily bookings at a glance. Plus a lot more. It's critical to strike a balance when it comes to automation. Fully automated billing saves time, but manual billing keeps you in control. That's why Habu supports full automation, but with a full set of manual overrides. 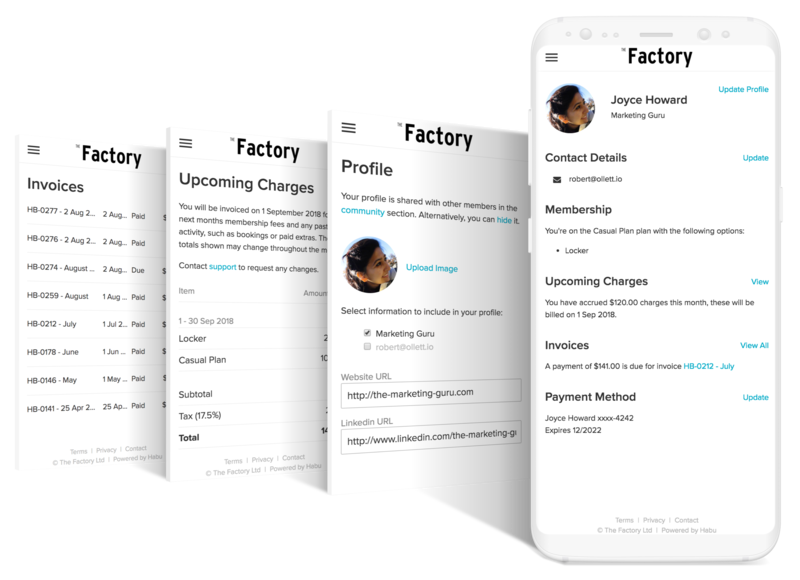 With customizable inquiry forms, you can keep external booking inquiries and generate new space hire leads, all while creating separate booking flows for members and non-members. Habu's simple CRM allows you to add qualified leads manually or capture them through Habu's customizable and automated signup forms. Users can add day passes or membership plans, agree to your T&Cs, and complete payment, all in the time it took to read this paragraph. The best part is that you didn't lift a finger. View all your contacts' useful details at glance, such as contact information, upcoming bookings, and membership plans. Filter your view to only those members on a recurring subscription, then filter further by membership type. Export data to view contacts and members in the comfort of a powerful Excel spreadsheet. Plus, add a connection to thousands of other apps such as Mailchimp, Hubspot, and SalesForce via Habu's Zapier integration. We're not out to do it all ourselves. So we integrate with other great tools to let you run your coworking space smoothly, simply and professionally. We make online payments simple through our integrations with some of the best payment providers in the world. Whether you're into recurring memberships or one-off payments, we'll track and sync transactions while maintaining payment transparency for you. Stripe are a global leader in consumer payment processing. Competitive fees and a user-friendly set up that takes moments make this integration invaluable for workspace managers. Adyen are the best kept secret in the business with exceptionally low rates and unmatched commitment to your security, compliance, and extensive global coverage around the world. Habu does billing beautifully. But you'll still need to bring our detailed, accurate billing data into a dedicated accounting platform. Where we don't integrate, we provide precise, powerful export functionality. Xero are a perfect integration partner with their clean design & simple interface. Our integration ensures invoice reconciliation takes minutes rather than days. In the coming months we'll be offering unparalleled accounting integration functionality for spaces. With Habu you'll be able to directly integrate with 15+ accounting platforms. Using another accounting platform? Or a human accountant? No worries. Habu's invoice exports provide the data you need to stay on top of things. Printer management made easier. Track member printing allowances and charge for extra use. Zapier allows you to connect Habu with thousands of apps and trigger almost any action you can dream up. Cloud-based keyless access control system that lets members enter your space easily and securely from the convenience of their smartphones. Sync your members and contacts from Habu with your mailing list. This integration is, you guessed it, fully GDPR compliant. Invite members from Habu to join your community slack channel and even send payment reminders. On top of offering integrations with the software that makes your space tick, we'll also be opening up access to Habu's API, which will enable you to fine tune Habu to your needs and make your experience even more phenomenal. We're looking at Q2 2019 so stay tuned. Accurate and effortless invoicing is at the core of the Habu billing engine. Whether you go for fully automated monthly billing or manual control, we make sure your money matters are taken care of with zero fuss. Our customers around the world know the value of efficient, accurate invoicing every month. Habu makes inaccurate billing and lost invoices a thing of the past. Stop doing the math or avoiding it. Habu does the calculations for you with first month proration on all new membership plans. Transparency is key to staying on top of things. With payment history, you'll always know where things are at, and so will your members with easy online access to their invoices. Keep total flexibility on the smallest level with ad hoc charges. Plus, add discounts and customize the tax due on a case-by-case basis. Let Habu do the heavy-lifting. 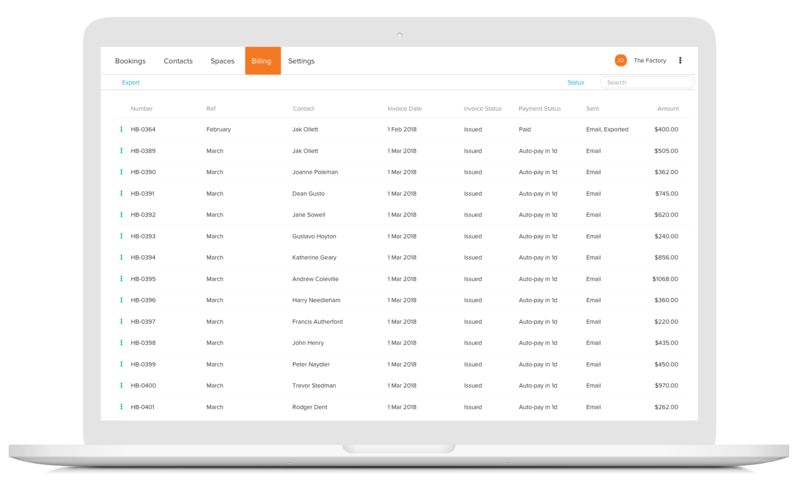 We'll automatically create and email out all your monthly invoices. This means you'll save hours, if not days, of work. Fully automate your monthly billing process with auto-payments for members. Using the card on file, we'll take what's owed from the invoice, then update the invoice accordingly. Make life easy for your bookkeeper by integrating directly with Xero or 15+ other accountancy platforms to synchronize your invoices automatically. Let's get real. No workspace is the same. So, if you want to charge by the week, month, quarter or year, we're there to support the way you do things. We work with best-in-class payment processors to offer you low fees, security and excellent customer experience for online payments. Accurate invoicing sounds like something you'd expect from every workspace management software right? Sadly, that isn't always the case with some of the leading tools out there. But at Habu, we’ve raised the industry standard with always-accurate, dynamic and transparent invoicing. Whether you're looking for complete billing automation, manual invoicing, or a mix of both, you can always trust our invoicing engine to power your billing needs with accuracy, efficiency, and flexibility. Let guests pay upfront and allow the members you trust to pay later. Choosing a different payment experience for members and guests is not only doable in Habu, it's dead simple. Habu retains an elegant design standard for all invoices, but doesn't stop you from customizing your invoice data. Include your logo, all contact info, company ID, tax number, and any other data you need to keep your invoices compliant. Plans are the core of a coworking membership. Which means you should be able to add what you want to them. 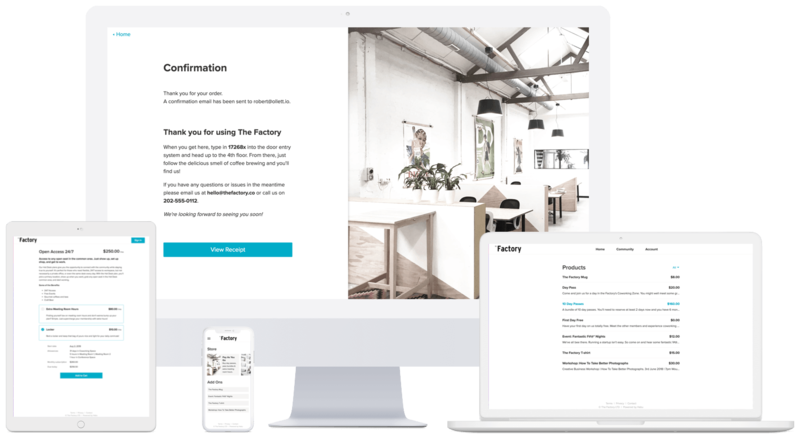 With Habu you can create customizable membership plans that are tailored to your space and brand, complete with allowances for workspaces, meeting rooms, and products in any combination you require. Let your members build their own plans with add-ons to allow them to customize their experience based on their needs. Add-ons let members sign up for additional services like more meeting room hours, 24/7 access, or extra workspace time, meaning that catering to different type of workspace users has never been easier. Making plans in Habu is elegant, simple and super-fast. Add a name, price, and allowances. Set your visibility and you're done. Optionally add additional details and embed in your website. You'll be live in moments. Allow members to sign up to plans on their own. They'll pay a prorated amount up front for their first month, then be billed automatically on the 1st of each month from there on out. Habu’s subscriptions engine allows you to further customize membership plans for each individual member's needs, by controlling how and when memberships begin and renew. With subscriptions you can adjust billing cycles (2019! ), activation fees, and discounts. Habu subscription engine offers prorated billing, plan change management, as well as custom plan and add-on pricing at the member level. Retain the benefits of standardized plan templates, but customize them on a per member level. Managing package deals, friends and family discounts, or hard negotiators is easy as pie. There's no need to cancel and recreate a subscription when a member wants to make changes. Simply change their membership, add or take away any extras, and Habu will update their subscription with the next billing cycle. With best-in-class payment processing partners, Habu can take payment from your members' cards automatically every month, or you can do it yourself with manual card payments. Sync directly with Xero? Done. Export your invoice data for other accounting systems? That's simple too! We work with Stripe and Adyen to provide payment processing all over the world and with new payment partners in the pipeline.